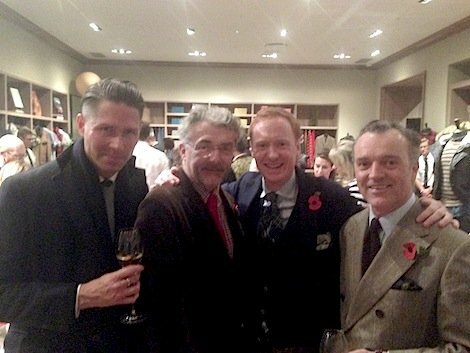 Last night there were two store opening parties: Kent & Curwen on Savile Row and J Crew on Regent Street. And while neither will get fans of luxury menswear that excited, there were good things at both for those on a budget. K&C might not seem that original in its flannel suits and cream trousers, but then readers often ask where they can get a good pair of grey flannels, and I now have somewhere to reliably point them to. Equally, J Crew does preppy menswear better than pretty much anywhere else currently in London, and there’s a reason their shirts have been so popular since Trunk started stocking them. Above, four drinking companions at the J Crew bash: Mats Klingberg (Trunk), Eric Musgrave (now Drapers), Michael Hill (Drake’s) and Douglas Cordeaux (Fox Brothers). You can follow the discussion on The likely lads by entering your email address in the box below. You will then receive an email every time a new comment is added. These will also contain a link to a page where you can stop the alerts, and remove all of your related data from the site. A mix of both affordable and bespoke would be great! After all you did start to review a suit that fits etc when you started out, you are an expert now due to luck and practice, you started out on a more affordable tangent. Obviously the focus is now bespoke but say a short article a week on affordable dressing would be very much appreciated! Thanks, I do try but will try harder! Of course. Anything in the name of research. Simon, is there any specific items at J. Crew you recommend? I live in US but I assume they sell the same stuff. I remember Derek at Put This On recommending their Bowery chinos. Simon – Perhaps you overlooked Ralph Lauren’s Polo as having preppy menswear? Unless you feel differently, I think his is pretty much the best. Perhaps a bit less quirky, but certainly preppy….